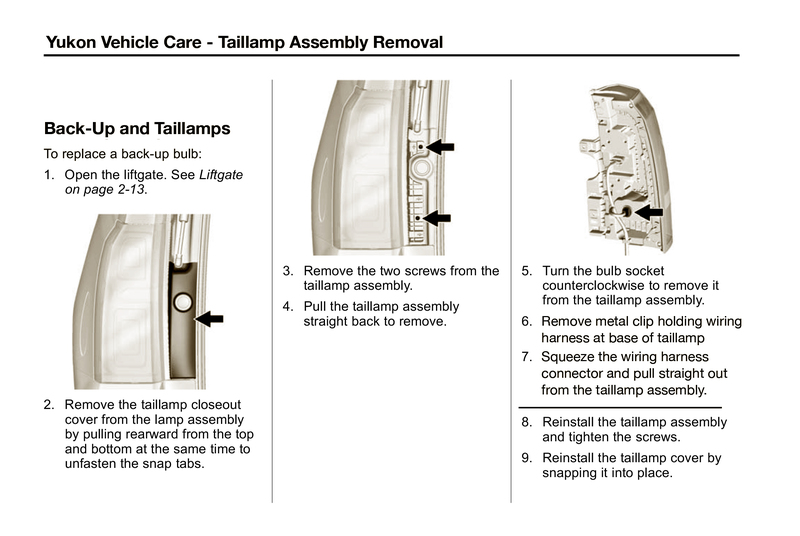 How to remove your GMC Yukon tail light assembly – If you have your GMC Yukon Owners manual, under “vehicle care” you will find instructions on replacing the back-up lamps. These same instructions identify the few clips and screws that you will need to remove in order to remove your brake light assembly. Locate your vehicle’s manual and turn to the correct page. Page numbers listed below, per model year, may be different based on your trim level or if Yukon Denali. Look for the “vehicle care” section or chapter for replacing the Yukon’s back-up lamps. Click on your model year below to be directed to my.gmc.com for a PDF version of your owners manual.